I hesitate calling Surreybrooke http://www.surreybrooke.com/ in Middleton, Maryland , a “garden center”. It is so much more – a destination for garden enthusiasts as well as photographers, children, artists, and everything in between. 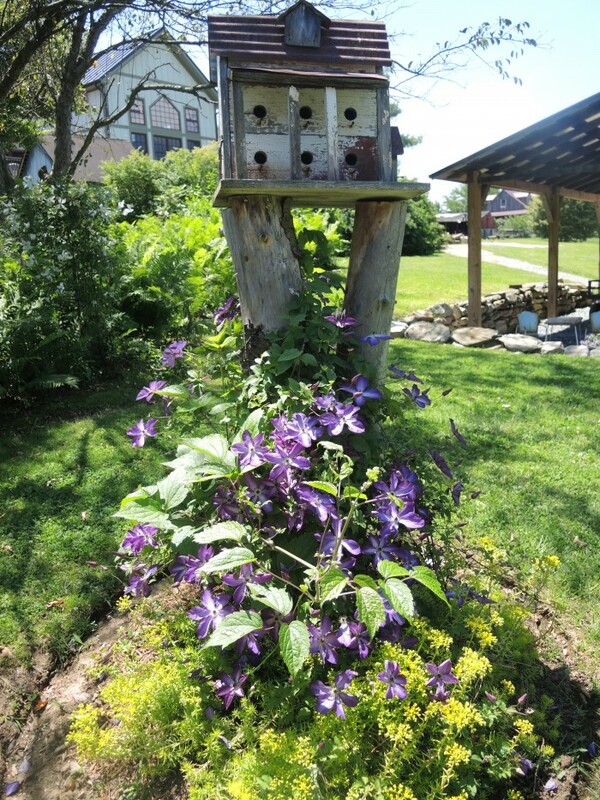 Brimming with unusual flowers, whimsical containers, historic log buildings, mazes, flower borders bursting with color, water features, garden art, and winding pathways leading to surprises around each corner- there is something that will appeal to everyone. I first stopped by Surreybrooke over 20 years ago, drawn by the beautiful one-of-a-kind dried arrangements and wreaths, that owner Nancy Walz creates. I rediscovered it about 5 years ago and was impressed with all the improvements. By chance I was in the Frederick area last week and remembered to check in. I was thrilled with how Surreybrooke has turned out! The plant selection was great even this late in the season, and when Nancy checked my selections out, she mentioned that a sale of “buy one, get one free” was going on. I was in heaven! 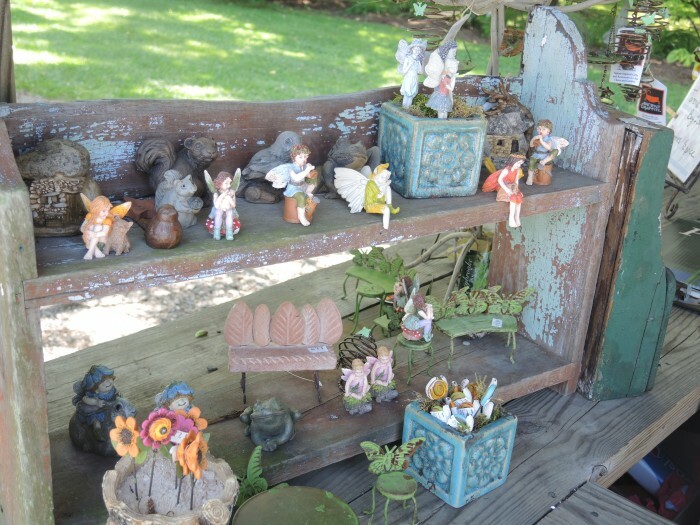 Long before “Fairy Gardens” became popular, Nancy Walz was selling fairy accessories and she has an impressive selection. I loved her quaint fairy cottages fabricated out of hypertufa!! I am going to try to make one of these. 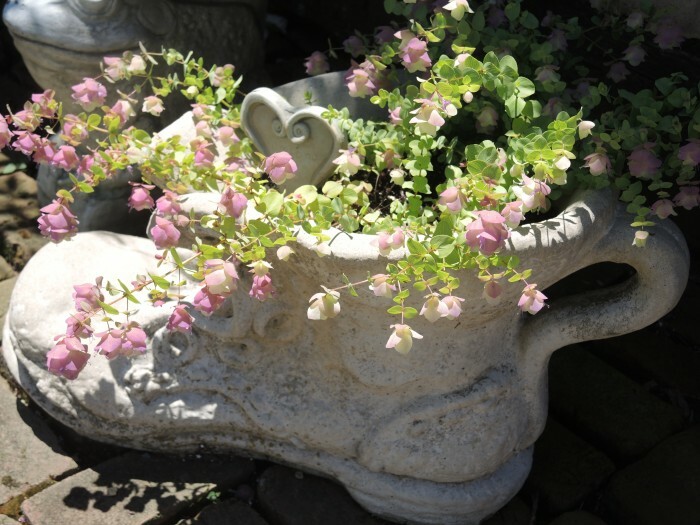 See my post on Hypertufa-Making Mud Pies to see how to create containers out of a mixture of Portland cement, peat moss, and perlite. 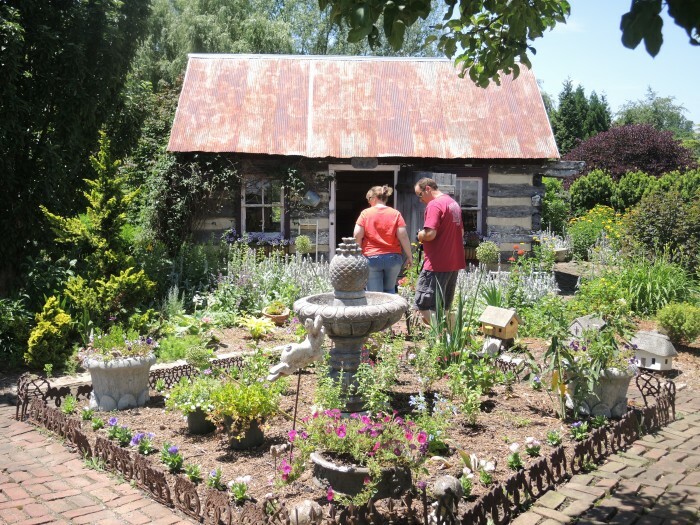 Turned into a plant lover’s paradise, Surreybrooke was a dairy farm in a former life. 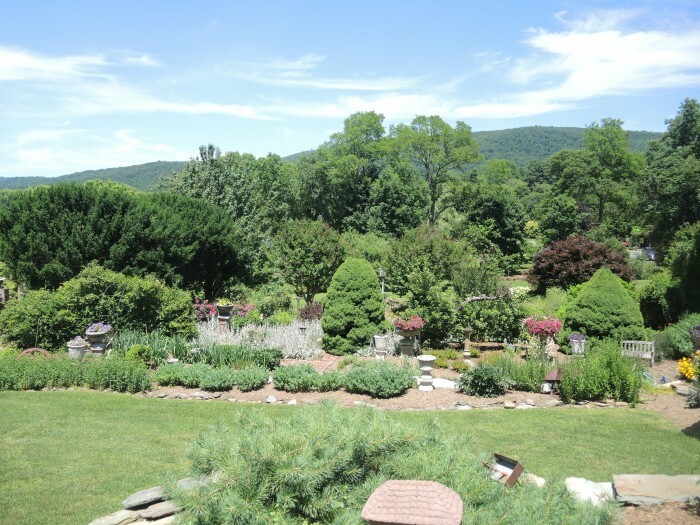 Specializing in herbs, hard to find alpines, perennials, antique roses, and unusual annuals, a gardener could wander for hours. Artifacts were used as props to showcase the plants. 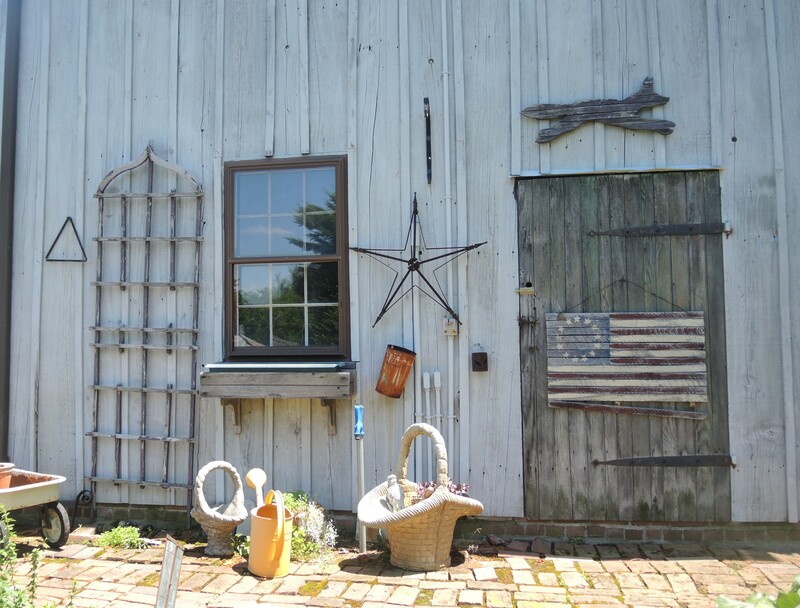 As my daughter exclaimed when she first entered the gardens “It is like American Pickers meets a garden center!” Seamlessly intermingling antiques and plants was done artfully and with care. 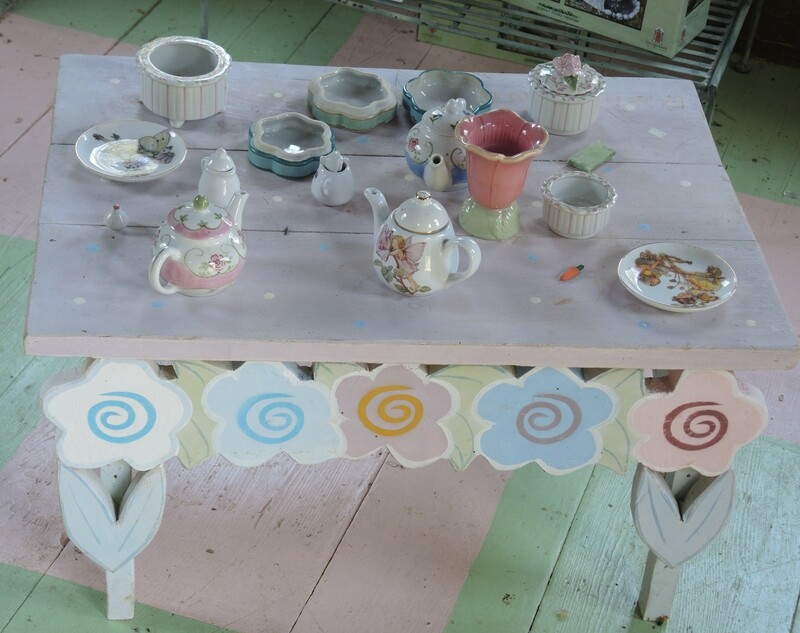 Children and gardening is a natural combination with Surreybrooke and they have found a niche by introducing kids to the wonders of gardening, with fairies, tea parties, Easter egg hunts, mazes, and pizza gardens. What a fun way to acquaint kids with gardening! Intrigued by the candle making room, I noticed racks and racks of freshly dipped candles for sale. 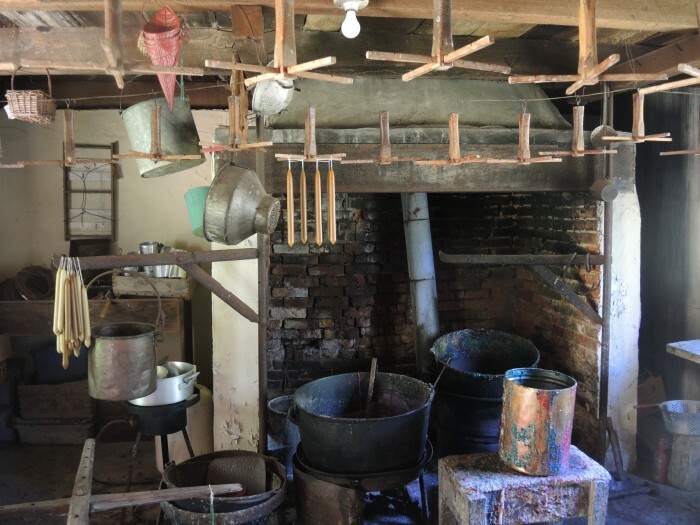 The former summer kitchen turned into a candle making house has a complete set up with a cauldron for melting wax and candle dipping apparatus. It look well used! 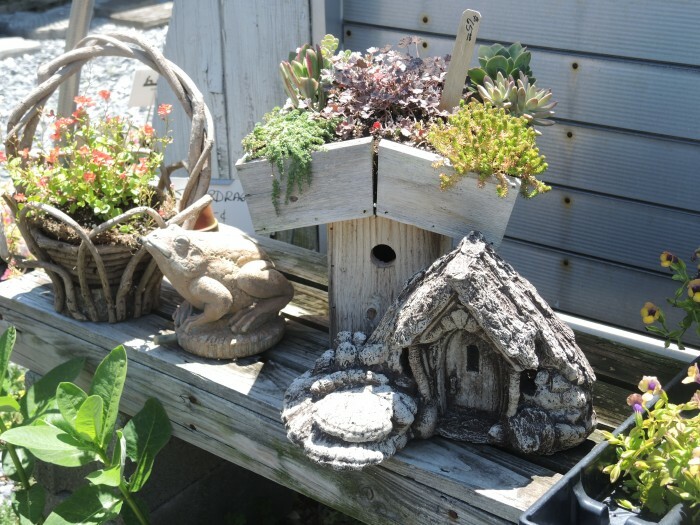 Instead of lining up plant selections on benches like most greenhouses and garden centers, Surrybrooke displays plants in vignettes which give you great ideas on what to buy and what looks good together. The plant selections were wonderful and the perennials were enticing. I was attracted to this Coreopsis, called Rt. 66 and took one home. What a fun place! Color me jealous! Thanks for bringing this place to our attention!. Very interesting and I wish to make it a point to visit. I had never heard of it and love the pictures you posted. Thank you Claire! I suggested it as a field trip for our garden club. Thanks for reading my blog. I use wordpress as my platform and it is very easy to use. Use good photography and good content.